This page offers a discussion of the challenges that anti-spyware vendors face in presenting scan results of detected programs to users and the solutions that some of the leading vendors have developed and adopted. Much of the discussion surrounding anti-spyware applications has focused on what kinds of potentially unwanted software ought to be detected and removed by such anti-spyware applications. While this question or issue is an important one, it represents only one of two related issues that anti-spyware vendors must grapple with. Threshold: threshold questions center on what criteria anti-spyware vendors use to determine whether or not a potentially unwanted software program will be offered to users for detection and removal. Presentation: presentation questions center on how those detected programs are presented to users for potential removal. To date, the question of presentation has received much less attention than the question of threshold (which is usually couched as the question of what the definition of "adware" or "spyware" is). Anti-spyware vendors are increasingly struggling with methods for presenting scan results to users, though, especially when users make several different, yet competing demands of anti-spyware vendors with regard to programs that prove "controversial." If anti-spyware vendors are to serve their customers and users effectively, they will need to devote more attention to the difficult and occasionally contradictory demands and expectations of their users. They will also need to recognize that the broad class of potentially unwanted software they target in their applications requires a more flexible set of methods for presenting detected programs to those users. Most anti-spyware programs scan users' PCs and present a complete list of detected items to users at the end of the scan process. Such a list of scan results can prove troublesome, though, because users make competing demands of such scan results. On the one hand, users are easily bewildered and overwhelmed by lists of hundreds of detected adware and spyware items -- an outcome which is not uncommon even on a moderately infested PC. Thus, many users insist that they want simple, easy-to-understand scan results that don't force them to make difficult too many difficult decisions. They simply want an anti-spyware program to detect and remove everything on their PC that is "bad," effectively pushing anti-spyware vendors to make a good set of default judgments and choices and to present those choices in a format that doesn't require too much knowledge on the part of the user. On the other hand, many users also demand that anti-spyware programs provide them guidance and information about the programs that are detected on their PCs. While many users simply don't want to be burdened with any decisions during the scan and removal process, others want to learn more about the software installed on their PCs. These demands push anti-spyware vendors to provide more information, not less, in the scan results presented to users. Still further, anti-spyware vendors are saddled with the challenge of figuring out how to detect and present programs that even their own customers and users disagree about -- "controversial" programs that some customers may find useful and may have deliberately installed but which other customers may find problematic and objectionable. Thus, anti-spyware vendors have been forced to figure out ways to present more information to users while presenting that information in an easier-to-understand, simpler format that doesn't overwhelm users or induce them to make poor decisions. They have also struggled with finding ways to satisfy users with contradictory expectations for the detection and removal of certain "controversial" programs. 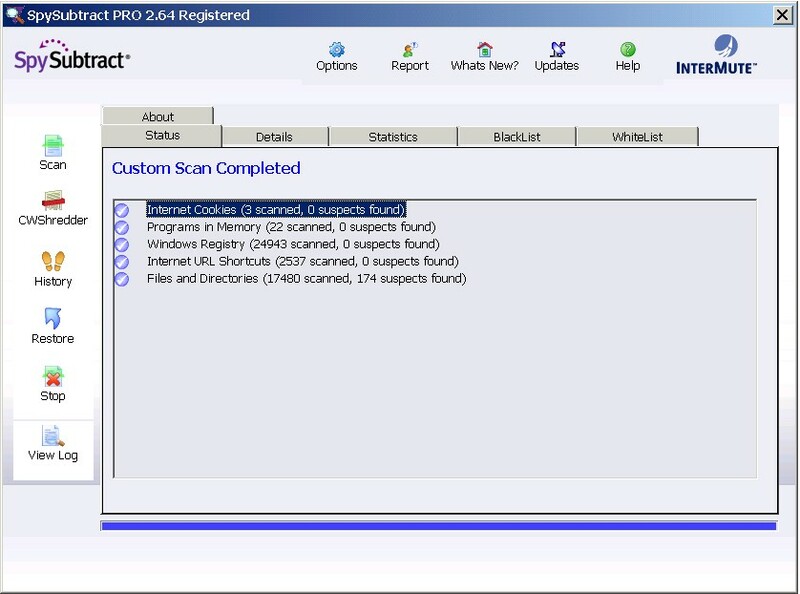 Over the past few years the top anti-spyware vendors have been revamping their scan results, simplifying the presentation of detected items, while adding more information to help users make better sense of what the program has found on the PC. In order to make these scan results more useful and understandable, vendors have begun implementing several changes and improvements to the scan results presented to users. Tree-menu results: vendors have started grouping detected items by "family" or "program" on an expandable tree of scan results, thus reducing the initial number of items presented to the user and making relationships among items easier to spot. More info: vendors have also started providing additional information about the detected programs or families to help users understand the functionality and potential risks of those programs. Special info: some vendors have even begun incorporating other types of information, such as a "risk level" and "recommended action." This new information adds to the types of information that anti-spyware vendors have typically provided about detected items, such as the item type (file, folder, process, Registry key), location (file path, Registry location, etc. ), and program type (toolbar, BHO, program, browser hijacker, etc.). To address all these challenges, it won't be enough for anti-spyware vendors merely to revamp the traditional scan results screen presented to users, though. Spyware vendors are increasingly being asked to detect a wide variety of programs that prove "controversial" for any number of reasons. In most cases, these programs are "controversial" because users and customers may regard them differently and may have contradictory expectations for whether they should be detected and removed. In such cases, it is legitimate for anti-spyware vendors to offer these programs for detection and removal to users, but they need to be presented to users in ways that accommodate the contradictory demands and expectations of users. Low risk advertising programs: some users do voluntarily and knowingly install advertising programs that are, comparatively speaking, innocuous. While these programs do display advertising of some sort on the user's desktop, the advertising is relatively non-aggressive and well-labeled. Moreover, these programs tend to be installed with the user's knowledge, often to support the free use of some program that the user desires. Nonetheless, given the functionality (advertising, data collection and transmission), there will be some users who want such programs offered as a detection. Thus, while some users may not want these "low risk advertising programs" detected and removed, others will. Potentially dangerous utilities: some users may install system and networking utilities that can be put to a wide variety of uses -- some legitimate, some not. When voluntarily and knowingly installed and used, these utilities can prove to be valuable tools. When installed without the user's knowledge and consent and used for nefarious purposes by parties other than the user, these tools and utilities can be dangerous and destructive. Again, some users may not want such "potentially dangerous tools and utilities" detected and removed; others will. To handle these kinds of "controversial" programs and respect the contradictory expectations of users, vendors will need to change the context in which scan results are presented to users, and this involves much more than simply tweaking the format of scan results or even revising the types of information included in scan results. In presenting such programs to users, the goal for vendors is to alert users to presence of such programs on their PCs and to offer users information to help them make good decisions about whether to remove them. 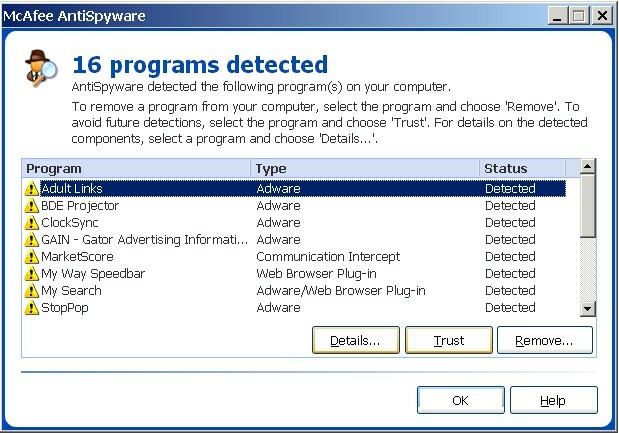 In doing so, though, vendors need to present these programs in such a way that suggests to users that these programs do not exhibit the same characteristics as the "spyware" and "adware" traditionally detected by anti-spyware programs and that users can elect to keep such programs, provided users understand those programs and actually desire to keep them. What anti-spyware vendors will ultimately need to do is develop new methods for presenting a wide variety of different detected programs to users, and these methods will need to go beyond merely presenting detected programs as "spyware" or "adware." To date vendors have developed at least three methods for changing the context of presentation to go beyond the traditional scan results used by anti-spyware programs. 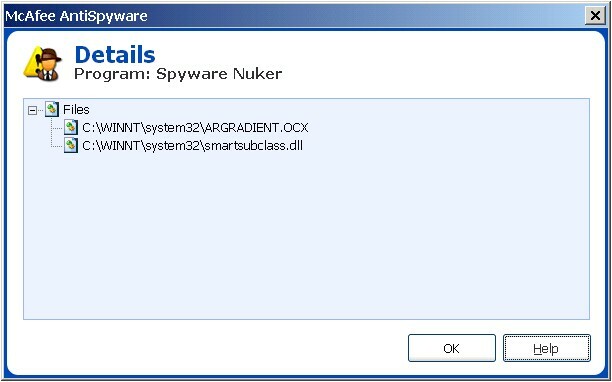 What follows is a menu of examples of scan results as presented in some of the leading anti-spyware programs. 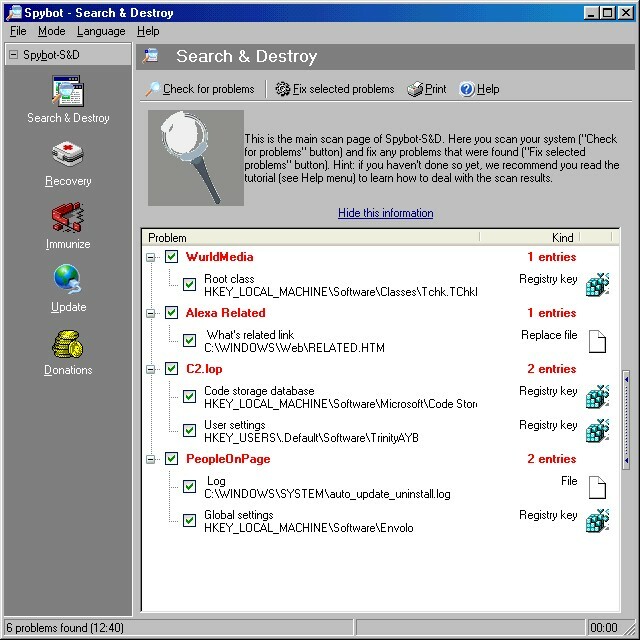 Spybot Search & Destroy was the first major anti-spyware application to simplify the scan results for users. Notice how the results are reported by primarily application (e.g., WurldMedia, C2.lop, PeopleOnPage). Users can expand each application to see details on the particular files and Registry keys associated with each detected application. Notice also how information about the detected applications is presented right alongside the scan results (an idea borrowed from Spybot Search & Destroy). As Microsoft AntiSpyware, like CounterSpy, is also based on the GIANT code base, it presents scan results in a similar fashion. This use of a summary screen followed by a tree-menu breakdown of scan results is a kind of hybrid borrowing from Lavasoft Ad-aware (which also uses a two-step approach) and Spybot Search & Destroy (which uses the tree-menu scan results). Lavasoft Ad-aware is the grand-daddy of all dedicated anti-spyware applications (version 1.0 came out in the fall of 2000), and its method for presenting scan results has been evolving over the past few years, though slowly. 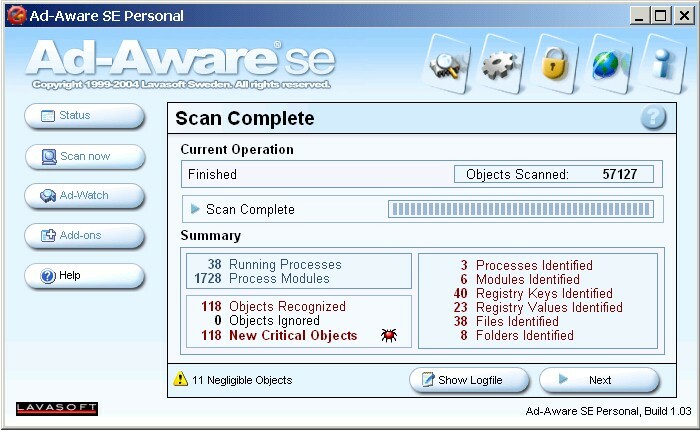 Unlike the tree-view summaries in other anti-spyware applications, Lavasoft's "Scan Summary" tab does not include the details of detected items -- those appear separately on the "Critical Objects" tab. In Ad-aware SE versions prior to 1.0.6, this tree-view summary was not selected for the user by default -- the "Critical Objects" tab was selected instead. These results are sortable by "Vendor," but the results are presented in one flat list, unlike the tree menus used by so many of the other reputable vendors. I would expect Lavasoft to move to a more manageable scan results screen in upcoming versions because this kind of flat list of scan results can prove overwhelming to many users. In one way or another, then, all of the reputable anti-spyware vendors have been experimenting with presenting scan results in a way that satisfies both non-expert users (who want simple, digestible information) and expert users (who want a wealth of detail about what specifically the application has detected). For now, the tree menu seems to be the most popular means for accommodating both types of users. SpySubtract uses what can be called a "pre-populated black list/white list." Most anti-spyware programs allow users to add certain programs or detections to an "ignore list" to exclude them from future detection. SpySubtract takes this idea one step further by building an "ignore list" during installation. First, during installation SpySubtract presents short descriptions of "controversial" programs to the user and explicitly asks users whether they want to detect and remove such programs. 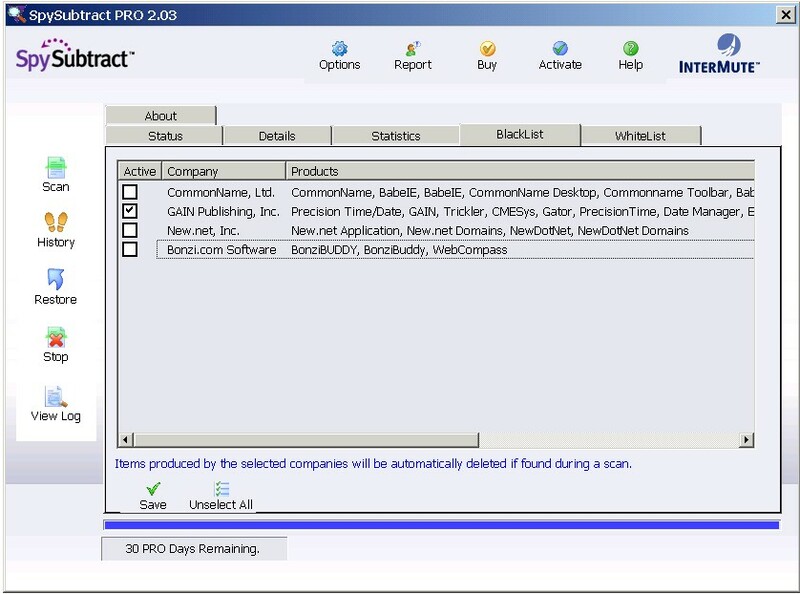 Notice that this "Black List" is pre-populated with several programs, which users can elect to detect by checking the boxes. Programs listed in the "Black List" will not be detected unless users affirmatively elect to detect such programs by checking the appropriate boxes. 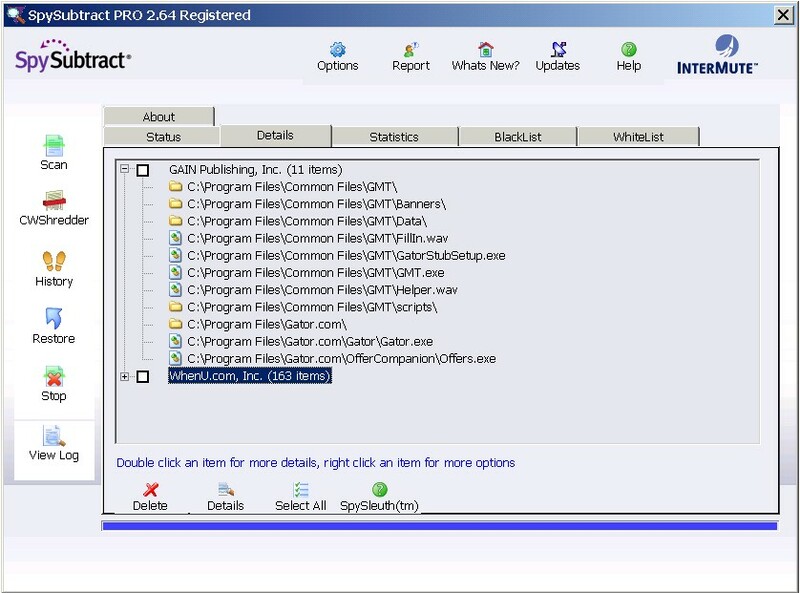 Users can add other programs to the "White List," which excludes programs from detection and removal. 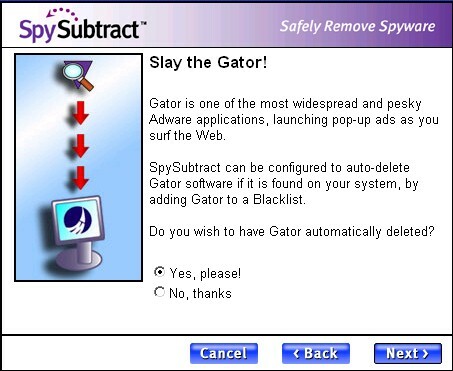 This pre-populated "White List"/"Black List" allows SpySubtract to offer a range of "controversial" programs for detection and removal, but only to users who actually want such programs to be targeted by SpySubtract. SpySubtract wasn't the first anti-spyware program to use such a "pre-populated white list/black list." Spybot Search & Destroy has incorporated similar functionality for several years in its "Ignore products" settings section. 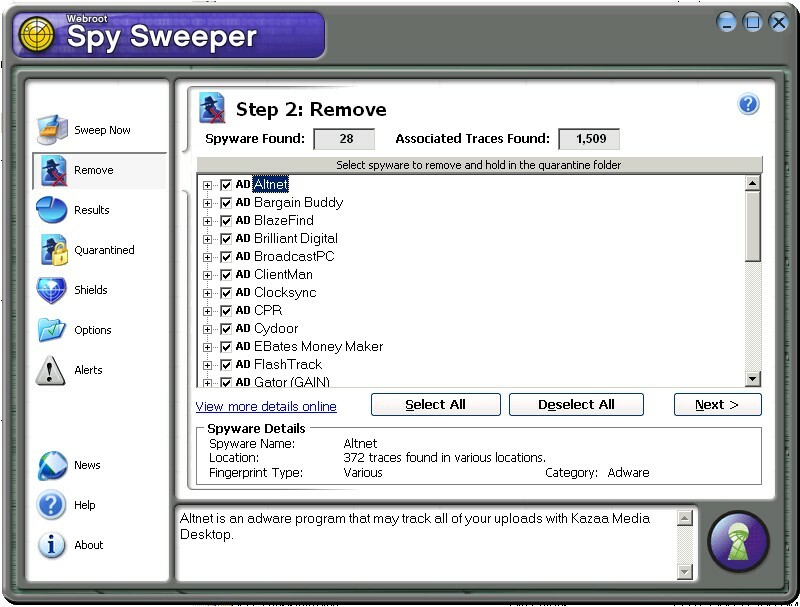 In the last few versions of Spybot several products have been excluded by default from detection, though users could choose to include such products in Spybot's scan and removal process by unchecking the appropriate boxes. The problem with earlier versions of Spybot, though, was that users were not warned that such an "ignore list" was being used. Moreover, the excluded products were spread across multiple tabs in the "Ignore products" section, making them somewhat difficult to find. As with SpySubtract's "White List"/"Black List," Spybot's "Ignore products" section allows the program to accommodate the competing demands of users with regard to "controversial," "potentially unwanted programs." Another method for changing the context of presentation for scan results is to spread detected items across multiple tabbed scan results pages. 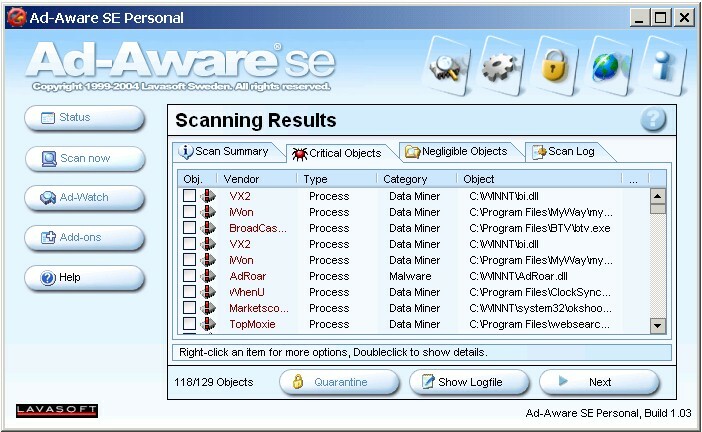 Ad-aware SE was the first major anti-spyware program to do this, putting "Negligible Objects" (usually Registry data about "most recently used" programs and files) on a separate tab than "Critical Objects" (detected "adware" and "spyware" programs). Aluria's most recent anti-spyware product, Aluria Security Center, takes this idea one step further by putting cookies and low risk programs (dubbed "Consumerware") on separate tabs than detected "spyware," thus suggesting to the user that these items have different qualities than "spyware" and should be handled differently. The goal with these separately tabbed scan results is much the same as the "pre-populated white list/black list" that we saw earlier: to continue to offer "controversial" detections to users, but to present those detections in a different way that accommodates the competing expectations of different users. The problem at present is that users have no way of knowing what particular programs are included in this category of "Info Only" detections. 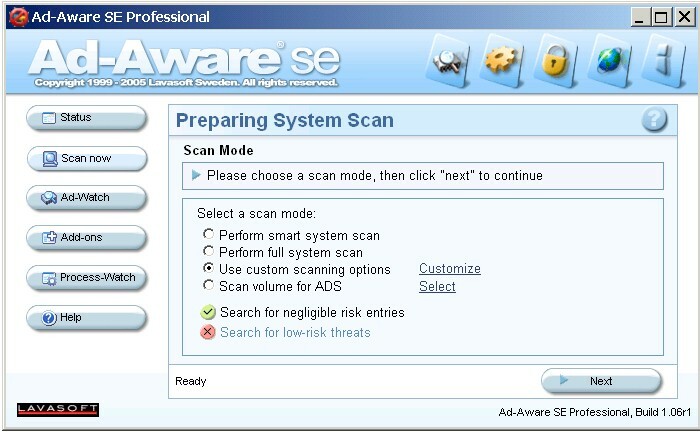 In version 1.0.6 of Ad-aware, Lavasoft also incorporated a similar "Search for low-risk threats" checkbox. This checkbox is de-selected by default. As with Spyware Doctor, the problem at present is that users have no way to find out just what programs are covered by the "low-risk threat" category. In recent months there have been increasingly vocal calls for anti-spyware vendors to collaborate on developing industry standard names, definitions, and classifications for detected programs. Standardizing names: that is, developing a common set of names for the detections (much like AV vendors have a naming convention for viruses and worms). Standardizing detections: that is, developing a common, recognized list of components for particular adware/spyware applications (e.g., VX2.Look2Me is comprised of XYZ files and ABC Registry keys). Standardizing names would certainly be the more easily achievable goal, though even that would require significant work and coordination. Standardizing detections would be much more difficult. One of the biggest obstacles to the standardization of detections is the fact that anti-spyware vendors currently regard their definitions databases as key components of their competitive prowess, and standardization of detections might mean divulging what they regard as semi-proprietary knowledge. One danger of any effort to standardize detections is that publishing a public set of detections would inevitably facilitate the growth of disreputable anti-spyware applications, many of which simply rely on publicly available data (e.g., from Pest Patrol's web site, SpywareGuide.com, Kephyr.com, doxdesk.com, et al) to plug into their definitions, thus allowing them to generate the semblance of a decent scanning application without doing any substantive research of their own. Much the same problem afflicts proposals that adware/spyware vendors share information about their applications so as to facilitate standardized detections. Such vendors would likely view such a proposal as tantamount to handing their enemies the bullets for so many anti-spyware guns. Thus, I suspect they would be willing to share such information only on the condition that it be used as part of a de-listing process. Even then, some of the worst actors out there (the CoolWebSearch gang comes to mind) would likely never share information about their applications, as their success in stealth-installing unwanted software on victims' computers depends in part on their ability to generate new, hitherto unrecognizable software components. Some of these entities might even shun the danger of communicating with anyone, so deliberately shadowy is their existence. At best you would get spotty coverage from such an effort, with a small number of well-documented adware applications from "top-shelf" adware vendors and a vast mass of muddily understood components from the borderline criminal gangs and fly-by-night scam artists. Standardizing Definitions of "Spyware" & "Adware"
Some have also suggested that anti-spyware vendors develop a standard set of definitions for terms such as "spyware" and "adware." These calls usually come from the advertising software industry itself. Such an effort would be less useful, I think, because the terms "spyware" and "adware" have very little use to begin with, being historical accidents of naming and pointing only to a broad, loose class of potentially unwanted software that defies easy classification. What such advertising software vendors really want is a standardized method for determining the threshold for offering a program as a detection to users of anti-spyware programs. While it would certainly be useful for anti-spyware vendors to discuss openly their thresholds for offering programs as detections to their customers, ultimately anti-spyware vendors must make their own decisions about how best to serve their own user and customer bases, which can vary from vendor to vendor. While there are legitimate complaints in that document, I can't help but note that while adware firms have been loudly demanding that anti-spyware vendors craft a clear, unified, objective set of standards and definitions for advertising software, they have been unable to come up with any standards themselves to police their own industry. This, from the gang that has been loudly insisting to everyone with ears for the past few years that "industry self-regulation" was adequate to the task of solving the problem of "spyware."